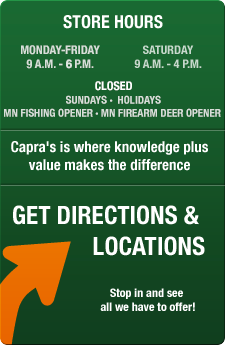 Capras Outdoors is your place for Marine Electronics. From its humble beginning as Capra's Marine Electronics in 1980, a repair center for the old flashers and paper graphs, Capras has become the acknowledged regional leading purveyor of Marine Electronics. We've tested and reviewed Fishfinders, GPS units, Marine Radios - all of it. We know what works, how it works, and how to assemble and install modern Humminbird and Lowrance electronic systems. And, most importantly, our pro staff of fishing experts can tell you how to run it, because we fish - and use this equipment too! If you can't find what you're looking for on the website, chances are we have it in the store or can order it from our manufactures. Give us a call at 1-877-780-4557 and we'd be happy to help. Now practically anyone can become an underwater treasure hunter without getting wet. This high-resolution video camera finds objects on the bottom, and switch activated claw picks them up.